Hi my name is, Ruby Alexandra Beloz, (AKA: Little Wizard, Indian Paintbrush & RGB). I am the Web Mistress of My Dad is a Vet. I created My Dad is a Vet after my Dad died. In a way it help me allot with my grief and at the same time do something for Veterans. It's my way of saying "THANK YOU" for our freedom. (In Loving Memory Of Rosendo F. Beloz US 187th Army Airborne ). He was my father but most of all my buddy! When he died there was nothing that could bring me any comfort but the memories we shared together. My Dad used to share with me some of his times in the Military and often said they were the happiest and saddest times of his young manhood. He loved being a Paratrooper. He once told me that "Only crazy GI's jump out of moving planes what does that say about my Dad? "Poems Of Distant War." My Dad raised us in Los Angeles California. He worked two jobs to give us what we needed and sometimes did a little spoiling of what we wanted but not too often after all there were five of us! The memories I value most are with my Dad when he would talk about living in America and loving his country. My Dad came home with a chest full of medals from the Korean War. I once asked him if he was a War Hero? My Dad turned to me and said "No Ruby all the Hero's are left in Korea they were my brothers they are the ones we call the true Heroes they earned it because they paid the price with their lives and that honor is reserved for them only." My Dad got sad for a moment as if my question took him back to a place in Korea for just moment and we both were silent no more words needed to be said I understood for the 1st time in my life what it meant to be a Veteran! I am proud to be my Fathers Daughter a Daughter of a Veteran. To me he will always be my Hero. 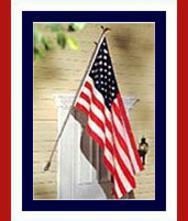 My Dad taught me at an early age why we fly our family flag over our homes door. He taught me to love my country and be proud of who my Father raised and our family name. 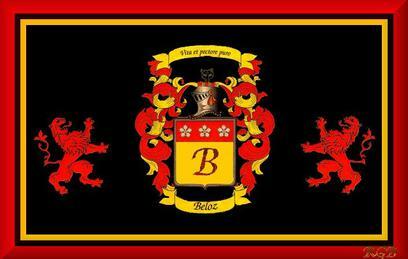 We are the "Beloz family we are proud to Americans." I have recently joined up with Mr. George R. Tanner Sr. to bring to you another tribute to our Veterans. The Web Site we created is called: VET1POWMIA. I hope you like it and enjoy your stay. Please sign our Guestbook and come back again. Henry Marion Tanner born November 13,1919 and was laid to rest October 21,1996 at Fort Sam Houston National Cemetery in San Antonio, Texas. He was a World War II Veteran and for the most part he never talked about his military endeavors. He was married to Mary Katheryn Smith and they had two boys between them, Charles H. Tanner and George R. Tanner. After the war my father went to work for the San Antonio Transit System as a bus driver and remained there for 32 years until his retirement in 1981. He was always a very hard working man, holding down two jobs to keep his family going. He is gone now but never forgotten. May he be at eternal resting peace with our Father In Heaven. with the 36th Inf.Div., 736th Ordnance Light Maintenance Co. The "Panther Division" is a sobriquet adopted by the 36th Infantry Division to promote spirit and pride during World War I training at Camp Bowie in Fort Worth, Texas. The name honored Fort Worth, which was known as The Panther City. An unofficial insignia depicting a fighting panther on a red, white and blue crest was displayed on military vehicles. The name was extremely popular on the Texas Oklahoma home front, especially with the newspapers in Fort Worth and Oklahoma City. Other names, such as the "Lone Star Division," were hardly ever used, but remain alive probably because that's the popular nickname given the Division by the American Battle Monuments Commission. While the American Expeditionary Forces awaited transportation home following the Armistice, all Divisions were required to submit their preferred insignias for approval by General Headquarters. Part of the reason was practical, to sort out soldiers from different divisions who had somehow become intermixed. The T-Patch, with the arrow representing Oklahoma and the T representing Texas, was approved for the 36th Division. Thereafter, the men referred to themselves as "Arrow Heads." The 36th Infantry Division was a veteran unit. A National Guard division from Texas with a history dating back to the Texas Revolution and the Alamo, the 36th saw service in the Spanish-American War and in World War I at the Marne and Meuse-Argonne. The unit was mobilized and mustered into federal service at Camp Bowie, Texas, on November 25, 1940, and put under the command of Maj. Gen. Frederick L. Walker, an Ohio-born Regular Army officer with 29 years of service. On assuming command, Walker took the unusual step of retaining the division's National Guard officers rather than replacing them with Regular Army officers, an action contrary to common Army procedure. Once federalized, the division underwent extensive training in Florida, Virginia and Massachusetts and participated in the Louisiana and North Carolina maneuvers of 1941.The "T-Patchers," 80 percent of whom were Texans, were shipped overseas in early 1943, arriving in Oran, Algeria, on April 11. The division was attached to the newly created Fifth Army, but did not see any action during the closing months of the North African campaign or in Sicily in July. When Italy was invaded on September 9, 1943, however, the 36th Division formed part of the initial invasion force. During 12 days of combat at the beachhead, the unit's infantrymen gave a good account of themselves, morale was high, and the division received the first of 10 Presidential Unit Citations and the first four of an eventual 15 Medals of Honor. Yet before the division was removed from Salerno for rest and refitting, it had suffered more than 4,000 casualties, the 143rd Infantry Regiment alone losing 1,144 men. Within two months the division was reinserted into the II Corps line near Mignano and Venafro, Italy, relieving the 3rd Infantry Division then engaged in the Winter Line campaign. During the next six weeks, the men of the 36th Division again distinguished themselves in heavy fighting along the Bernhard Line and in the battles for Monte la Difensia, Monte Maggiore, Monte Lungo and Monte Sammucro. The gains made, however, came at a high price. In the battle for Monte Sammucro alone, the 143rd Regiment lost 1,059 men. It suffered a further 1,400 casualties in the battle for San Pietro -- one American casualty for every Italian living in the village. Thoroughly exhausted by December 30, the division was again pulled from the line. Over the course of the next two weeks, the division received 1,014 enlisted replacements and 90 officers, most of them going to the grossly understrength 143rd Infantry Regiment. The majority of these new men had only 17 weeks of infantry training before they arrived in Italy, and most of the commissioned replacements were fresh from officer candidate school. SP/4Shannon M. Torres SGT Charles G. Smith Of Oswego, IL. 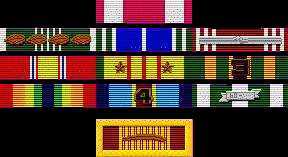 April 13, 1988 To April 12, 1996 4th US Army, Quartermaster Corp.
for 6 months with the 340th CS CO.
Supply & Service out of San Antonio, TX. I'm George. I spent over 20 years in the military, ready to defend our nation at any time. I was different than most however, I went through Basic Training twice Sept. 1964 and Oct. 1970. It was called a break in service, needless to say I wasn't thrilled about having to do that. Anyway, I always was there ready and never knowing when the price of "FREEDOM" beckoned the call to defend it and our country once again. I spent a tour in Cu Chi, Vietnam Jan. 66 to Dec.66 and was luckier than most I came home. I still grieve for those who weren't as fortunate and sacrificed all or came home maimed with shattered hearts and minds. I joined the US Army for two reasons, I was young and needed something to do and I could not think of a better way to do something not for just myself but my country as well. So at the age of 17 with my parents consent. I began to take my first steps into man hood. Little did I know the road of hard knocks was really just beginning. I learned quickly at basic training in Fort Polk LA. that I was going to grow up quick. After my 8 weeks of vacation learning to be a soldier I decided then I never wanted another vacation like that again. It never dawned on me while I was on a new venture into life what I was in for. Upon graduation from basic training I departed there for my new home and what I thought was going to be a paradise dream come true. I was going to Hawaii the 25th Infantry Division at Schofield Barracks. I thought what away to start out my new life. Little did I know I was in for even more adventurous training and that I hadn't seen the worse yet. Out of all the training, The CODE Of CONDUCT SURVIVAL TRAINING, I remember most of all. It has stuck in the back of my mind and most recently I was awakened by its chilling calls. Calls that there are many of our American heroes perhaps still, that are living out horror in not just a land for away but at home as well to. We must never give up that last hope to fight for their freedom and to bring rest to those in our home land as well. It all came back a few months ago when I came across a 13 year old girls web site, http://www.nikkiusa.com . Her name is Nikki Mendicino. This young lady not only inspired me but touched my heart as well. She represents the forgotten heroes, the POW/MIA'S. 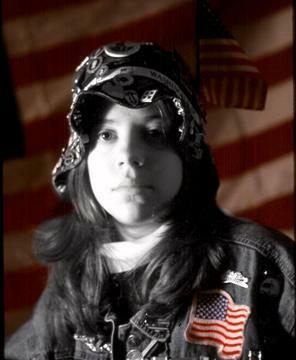 It is said she is the Worlds Youngest Veteran POW/MIA Advocate as well. It was because of her willingness to spend all of her additional time helping others mend broken hearts and volunteering countless hours representing the veterans from all over the world that gave me the motivation and wake up call to get involved as well. It was from that point, I started searching for what to do. Upon receiving the 4 soldiers that I was to represent from Operation Just Cause located at http://www.ojc.org/adopt/index.html. I requested the Virtual Bracelets from POW/MIA Place at http://www.ohiopowmia.com/virtual_bracelets.html. My next step was to find someone to build me a web page. I wanted someone who would take pride in what they did to represent and honor along with me all the servicemen and women, all the veterans that has served our great country, to our men and women who have made the ultimate sacrifice and most recently to the tragic events that have unfolded with violent acts against the American people and their freedom of life. As time moved on and I was searching for help, I met the lady that was to create what is now the VET1POWMIA site. She has many talents and dedicated to helping others as well. It was because of her this web page has grown into a large site and the life of this site has spread it's wings and took flight. I welcome my partner the web mistress of this site Ruby Alexandra Beloz. 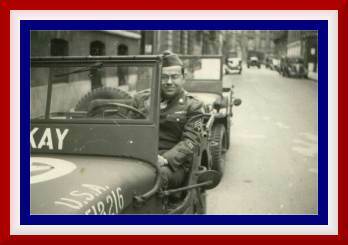 I am dedicating this site to our fathers Henry M. Tanner and Rosendo Beloz both of the WWII era, who have both recently passed away. The saying goes, "GOOD SOLDIERS DON'T DIE THEY JUST FADE AWAY"! I truly hope everyone will enjoy our site and visit it often for it is updated frequently. Orginizations I belong to as Life Member: 25TH Infantry Division Association, Veteran's Foreign War's Post 2112, Sparta WI., Disabled American Veteran's Chapter 52, Vietnam Veteran's of America, Inc. , Non Commissioned Officer's America and The Retired Enlisted Association. Other memberships Uniformed Disabled Retirees and AMVETS.